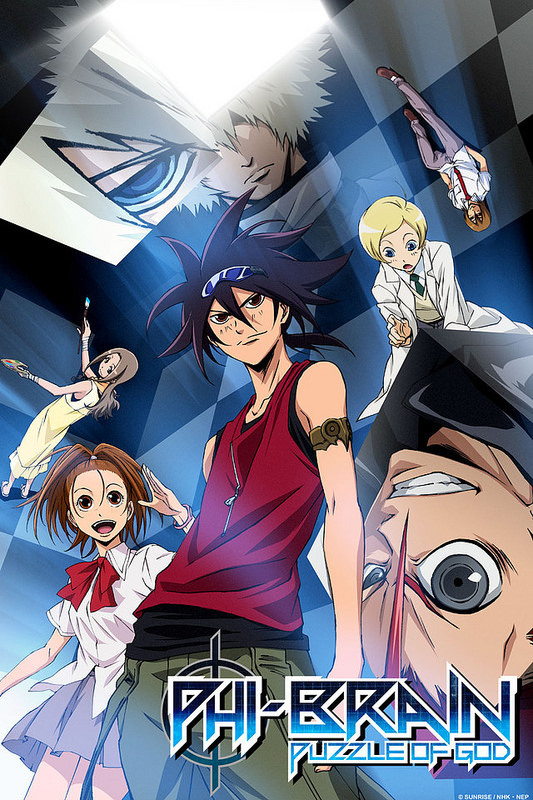 It’s time to take a look at season 2 of Phi Brain. The first season was definitely a rock solid show. We got a bunch of great puzzles and in general it was a pretty unique show. I haven’t seen many like it so it was good to have the title return. While season 2 does retread some ground from the first season it’s definitely a great follow up. It’s not quite as good as the first season of course, but the quality is very close to that of the original. The season also does start off with a bang. 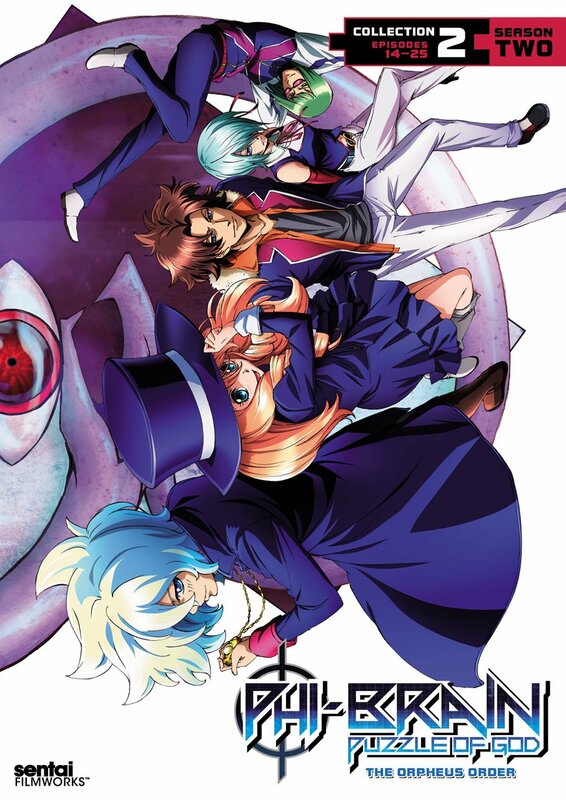 Kaito and the rest of the Phi Brains are hanging out at school when they are challenged by a new villain group. They call themselves the Orpheus Order and right off the bat they challenge the heroes to a group battle. 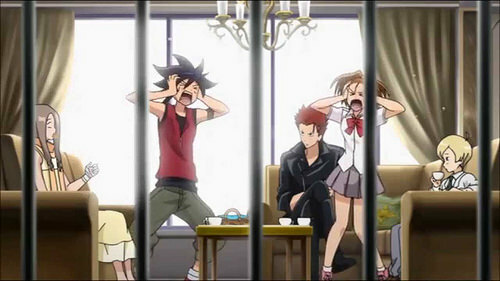 Kaito and Gammon can handle themselves well enough but can the rest hold their own? 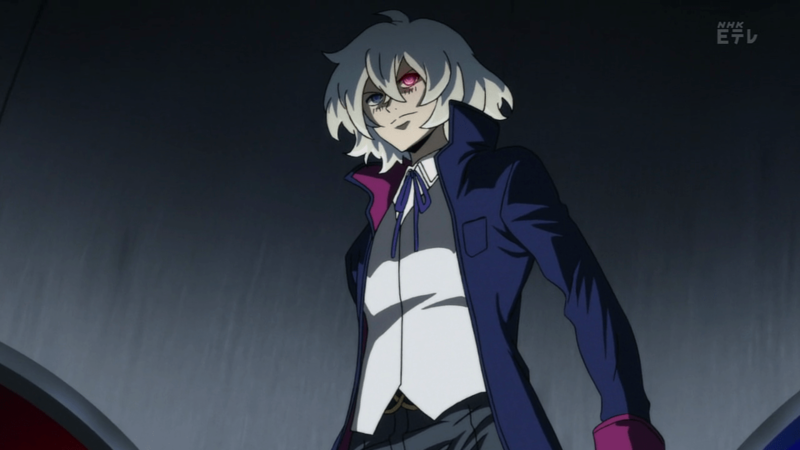 The leader of the Orpheus Order is named Freecell (Or is he the leader?) and he seems to have some ties to Kaito from the past. Kaito doesn’t remember this guy or the promise he supposedly made. Either way Kaito has to stop these guys, but the Orpheus Order is more expansive than they can imagine. Kaito may need to call on his old friends from the POG for assistance. I always like it when the villains make a move right away. Why bother waiting 20+ episodes to appear when you can storm the hero stronghold in under 10 minutes? It’s really impressive just how quickly they move. I also really like the idea of a team battle. It’s basically a 5 on 5 match as everyone plays a square related game. It’d be even cooler to have everyone moving at once, but logistically that’d probably be a nightmare so this makes sense. 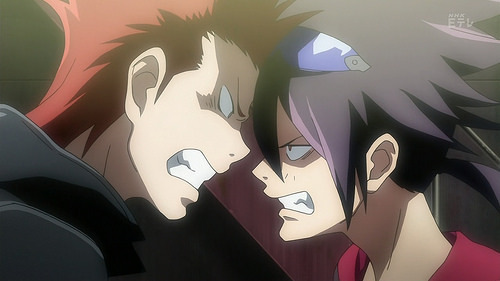 It’s still super tense because even if Kaito wins his round there is no guarantee that the whole team will win. One advantage the season immediately has over the last one is that Kaito isn’t sidelined for every other puzzle. In season 1 there kept being a ton of different circumstances that would keep him out of a fight. First we had Cubik come out with something that prevented Kaito’s brain from activating, then he went through an emotional breakdown where he forgot how to do puzzles, etc. There were so many episodes where Kaito could have solved the puzzle easily but then something happened and he had a hard time. Here the only times Kaito is having a difficult experience solving the puzzle is because his opponent is that good. In season 1 a lot of the puzzles were 1 player, most of the ones in season 2 are vs puzzles so you’re actively fighting someone. It makes a huge difference on how you go about solving it this way. Even Nonoha gets to duel in one puzzle which was definitely interesting. Her photographic memory unfortunately isn’t too helpful in most cases, but she always tries which is good. The Orpheus Order has quite a few members so lets quickly talk about them. First up is Freecell who serves as the main antagonist here. He blames Kaito for the death of his mother, but gradually we learn more and more about his full backstory. He makes for a good villain, but typically he’s at his best when Kaito isn’t around. For example, his confrontation with Klondike is his best scene. It’s awesome and one of the best moments in the whole show. When he’s with Kaito he gets a little more delusional and in some ways is just Rook 2.0. Overall I did think he made for a pretty great villain though. He may not have been the most original villain in the series, but the execution was on point. If anything it’s too bad we didn’t get to see him fight more. I wanted to see his new powers in action. Then we have Pinochle who is definitely the worst of the group. He’s the kind of guy who goes for mindgames and intimidation right off the bat, but can’t pull it off. As a result he seems more like a try hard and never becomes all that interesting. It’s a shame since he gets some of the most development out of the characters. Next is Mizerka who also isn’t too great, but she’s a step up from Pinochle. She needs to have a use and so that probably makes her the most loyal out of all the members. So long as the leader gives her a task she is happy to complete it. Her character is tied pretty closely to Melancholy so you can probably expect that things don’t go too well for her. She also tends to get psyched out by Ana as Mizerka takes everything very seriously. Next up is Doubt and since he’s Gammon’s rival you can imagine that he’s pretty solid. (For the most part all of the Orpheus Order members have a natural rival) He can fight which is handy and he always struck me as the strongest main member behind Freecell. By the end of the series it is strongly implied that this isn’t the case. Things actually get pretty dicey for Doubt in general in the second half. Still, I liked his confidence and as the tough guy of the group he served in his role pretty well. It took a while for me to realize that his name was literally “Doubt” though. Then we have Melancholy who is pretty young compared to the other characters. Still, that isn’t to say that her talent is lacking in any way next to the others. She’s always confident and sarcastic aside from her final scene. I don’t think she really got any closure compared to the rest of the group so it’s a shame that Melancholy couldn’t have gotten one more puzzle battle. Likewise, Whist gets a lot of hype throughout but ultimately doesn’t really get to do anything at the end. He does have a lot of hype moments in between, but at the end of the day he didn’t have the breakout duel that you’d expect. The butler from season 1 was definitely more impressive in that regard. Klondike is the head of the Orpheus Order so you definitely expect a lot out of him. His role is pretty small, but definitely very powerful. He instantly became one of my favorite villains in the series. The guy’s so good at puzzles that he reached Kaito’s level during his first time even trying one out. The guy’s potential is nearly limitless. He’s another character that I would have liked to spend more time with. I suppose there are just too many characters for them all to keep on appearing, but it’d be nice if he could appear again. I suspect this was probably it for him. That wraps up the new villains here. Well, we have Ana’s sister, but she really didn’t add anything to the show. I didn’t even realize Ana still needed a backstory although I suppose maybe it was hinted in season 1? She has her big moment at the end of course, but for the most part she’s pretty forgettable. We do see the return of an old villain from the POG arc. I won’t say who, but his role here is pretty fun. Despite the fact that this guy is always whining, he can apparently fight as he actually takes down Doubt. It was definitely intense to see him again even if I don’t really get why the villains humored him for so long anyway. I suppose testing the villains’ loyalty and Kaito’s progression is always good, but I feel like there were other ways to do this. Rook and Bishop may be on a quest to destroy all the puzzles of fools, but they do take the time to quickly show up here when Kaito is in trouble. Bishop never really gets to duel, but Rook has some nice moments. His tag team duel with Kaito was definitely pretty cool. It’s always fun seeing the old villain show up as more of a rival in the present. It’s a nice character development moment. 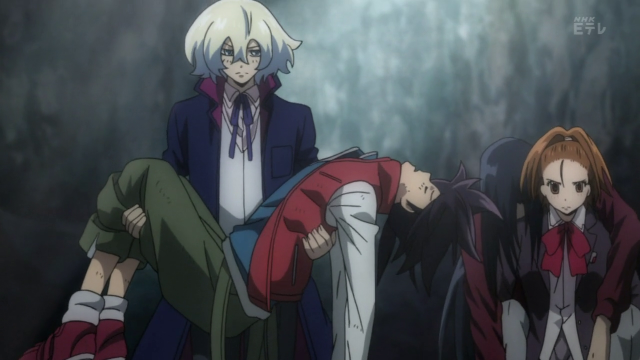 It would have been nice to see Rook fight with Freecell, but I think that may have ultimately been too much for him. The other POG members show up, but only the celebrity member really gets to do anything. The rest just panic a whole lot. From the supporting characters, Tamaki probably gets the biggest role. She has to step in as student body president and naturally the villains make a move. The season is long enough where there are several sections in the plot. At one point what the villains would do is go around mind controlling people. Tamaki ends up being one of those targets. Jikukawa as well, although his was a lot more epic. It made for an excellent cliffhanger when he showed up and challenged Kaito. The guy always had an interesting history as he was close to being a Phi Brain, but decided not to do so. I guess this was his chance to test all of that. I do think his plan to put on the ring was a little sloppy, but it all worked out in the end which is what counts. From the Phi Brain children they mostly just get a role in the first half of the season. By the end they aren’t really able to help out at all and just stay on the sidelines. Ana’s role near the beginning is to annoy Mizerka and of course the whole thing with her sister. Cubik is heavily involved with trying to figure out how the rings work and Gammon tries to teach Doubt a lesson for involving his sister. They’re all pretty consistent with how they were in the first season. In that respect, Gammon’s the only disappointing one here just because he had such a big role in season 1. He was Kaito’s rival while now he is treated more like an underling. It’s clear that they are no longer on the same level. I suppose it was inevitable to an extent but it’s still a shame. Nonoha still gets a big role of course as she is always ready to support Kaito. She also helps get Freecell to sort through his emotions in time for the final boss. She’s definitely an integral part of the story. Finally we have Kaito. As always he’s definitely a great main character. He doesn’t really suffer from the same levels of doubt he had in season 1. The mindgames still shake him up a bit from time to time, but for the most part he’s gotten past all of that. He’s now in a spot where he can just enjoy puzzles again. He’s definitely a fun main character and his aggressive nature towards solving puzzles has served him well. I’m glad he chose to do the puzzles without the armlet as well. In season 1 he basically surpassed it so that would have felt like a step back. Naturally the soundtrack is still great as we have a lot of old themes that return. I do miss the classic samba type music that played though. I don’t even know what style of music it was, maybe Mexican? It fit really well for the tombs, but I guess with the change of scenery for season 2 the directors thought it wouldn’t be a good fit. Still, on the whole we get the rest of the epic tunes. Then for the animation it’s pretty consistent with season 1. The visuals are still nice and shiny. It doesn’t stand out too much in particular, but it all looks good I’d say. Most of these puzzles aren’t exactly made to look super flashy anyway. I think one difference here compared to the first season which does hurt a bit is that it’s more up and down. I feel like season 1 was consistently excellent with high stakes while this one could fluctuate. At its best the hype moments were even better than season 1’s. The Klondike duel, Jikukawa turning evil, the big duels with Freecell, Rook jumping in, etc. These are all show stopping moments with how amazing they are. At the same time, then we have the episodes that feel like they’re just trying to buy time. These include moments like: Ana’s sister, Tamaki turning evil, the puzzle adventures on the island, etc. Not to say that any of these episodes are bad. They just feel like filler thrown in the middle to buy some for the villains to make another serious move. Since season 1’s episodes were mostly all introducing the characters and getting us to know them even the “filler” felt important. It’s a perk that season 1 has which is supposed to be countered by the fact that season 2 can just jump right in. It’s a good balance and as I mentioned before, the seasons are still very close. Overall, Season 2 is definitely quite solid. I do like the idea of a villain group of geniuses. We do get some cop outs in terms of the whole group being Phi Brains, but the higher ups still delivered with the fights. Phi Brain will continue to succeed as long as they keep thinking of fun puzzles. Season 1’s were still more creative, but this season definitely had enough hype scenes to match 1. I look forward to seeing how season 3 stacks up. Who can possibly challenge Kaito and friends now right? Maybe there’ll be a super Armlet of Orpheus or something like that. It’s time to look at a puzzle anime which is pretty unique. There are a few puzzle franchises out there, but if we’re strictly looking at shows the only one that I can think of is Layton and I haven’t seen that one yet. A puzzle is different from a mystery after all as you’re trying to find the way to complete it, not so much finding out who made it. The season’s definitely a lot of fun and basically handled everything flawlessly. It’s a show that you can certainly recommend to anyone and it has no weak points. The show starts with Kaito Daimon (Get used to his full name as all of the characters like using it) beating the puzzle club’s best puzzles once again. Try as they might they can never defeat him and that’s because Kaito is a genius. His catch phrase is “There ain’t no puzzle I can’t solve” which is a triple negative so it basically turns into “I can solve all puzzles!” It’s definitely one of the best catchphrases I’ve heard in a while although “I’m not done yet!” still wins at the moment. His best friend Nonoha isn’t any good at puzzles but they still get along pretty well with how different they are. Kaito’s life gets a little more complicated though when an evil organization known as the POG shows up. They have begun setting up puzzles which are designed to take the life of those who challenge them. This goes against what Kaito believes puzzles should be like. He plays them for fun after all. Now he is obligated to try out all of these puzzles so he can solve them before anyone gets hurt. He registers with the school as a genius with an official title so he can go after the POG and is also chosen by the Armlet of Orpheus which grants him super human intelligence for a time, but also completely exhausts him. He won’t be alone though as 3 other geniuses from the school, Gammon, Ana, and Cubik are also chosen. Together they have to stop the POG, but are these other guys just holding Kaito back? If so…how can he get them to back off? A great deal of the season is shrouded in mystery as we only learn more about the POG in small steps. At first all you really know is that Kaito has to stop them. Gradually we see inside of the POG. Their motives, how the organization works, etc. Especially towards the end as we get a full flashback episode and you get all of the context. I’d say that the show does a good job of answering all of its questions. I still have to question how practical the POG is. Apparently they used to be more of a heroic organization but gradually they became more ruthless and were just hiring a bunch of murderers. However, from the start they were going around murdering people so it’s safe to say that this was all a front. If anything the disturbing element of the POG is how like most other cults they get a lot of people who seem like ordinary citizens to quickly be eager to destroy their fellow man. It’s definitely not what you would expect from a teacher at the local school for example. The POG also gets away with quite a lot to be honest, but I suppose one day the cops will learn of them and they’ll all do some time. Back on target, as I mentioned the puzzles are one of the big selling points of the show. They certainly deliver. All of the puzzles in the show are properly explained. They are nice and complex without being hard to understand. For example, when you see the puzzle you will quickly know what to do even if you aren’t sure how to find the actual answer. The puzzles are just written really well. My favorite one is probably the Lightsaber duel. There’s a lot of strategy there while also being more of a physical test of skill since you also need to be able to move fast enough to pull off most of the moves. The same can be said for some of the other puzzles like the battle atop the construction building. If you can’t run from pillar to pillar fast enough then it’s really all over. The animation is quite sharp. I like the effects that are used for the armlet and the glowing eyes that Kaito and Rook have. The energy effects are just very vibrant and same with all of the backgrounds. The show always looks sharp and you can tell that a good amount of effort was put into it. I also greatly enjoyed the soundtrack. It’s an interesting Brazilian/Portuguese type soundtrack with a lot of fast paced tunes that work well for the puzzles. The theme song is also really good which is definitely fortunate since the whole season just has one. iI still think that a theme song should change every 13 episodes, but I suppose that can get expensive. It’s definitely a memorable bundle of songs so that is reason enough to give this one a look. Now lets look at the main cast. Kaito is our main character and he’s a good lead. He is very confident throughout the series and never even considers the fact that he might not win. He knows that he is a top notch solver and I do tend to enjoy characters like that quite a bit. He does have a few times where his confidence is shaken thanks to stuff that happened in his childhood which the villains love to use against him. Still, it never keeps him down for long and Kaito always bounces back. He has to work extra hard most of the time so he wins the puzzle while still saving his opponent. It’s definitely not an easy road, but it’s one that he can handle. The best character in the show is certainly him or Gammon. Gammon is the rival here. He’s another very confident character who is convinced that he is the best. Initially he is a solver like Kaito but eventually he remembers that he used to be a Giver. (Givers create puzzles while solvers…..solve them) This leads to a rather iffy decision where Gammon joins the POG for a while. Now this is where it’s pretty complicated. See, the show doesn’t play it off as too serious a thing. He betrays the heroes and works for a bunch of murderers, but he never personally destroys anyone. The heroes also seem to think that he knew they would survive each time which is why he had no qualms about murdering Kaito. Still, it’s taken quite far so even if the heroes can forgive him I’m not sure if I can. At the very least he did drop from being my favorite character to going under Kaito. I suppose I’ll put him in 2nd for now, but it will be interesting to see where his character arc goes from here. His tale is tragic at times admittedly as he is quite good, but always gets overshadowed by Kaito. That’s why it was interesting to see him as an antagonist since he busts into the villain base and starts taking everyone down. The fact that he was able to beat everyone aside from the boss Rook (Who he never got to fight) is quite telling. Nonoha is the main heroine and she’s a fun character to have around. She can actually fight unlike most of the cast which is certainly handy in case any of the villains decide to take matters into their own hands. I also like how she was helpful right from the start like in the very first episode where she helps Kaito during the maze. Yeah, she almost fell to her doom, but it was a good effort. She’s always around to cheer Kaito and the gang up. Even after all of Kaito’s friends start running scared she manages to stick with him the whole time. Definitely a quality character and even if she can’t solve puzzles hopefully she continues to get a big role in the next adventures. Cubik is one of Kaito’s less impressive friends. He tries to stop Kaito from solving puzzles several times. The worst instance of this was when he put something on Kaito that wouldn’t let him focus on puzzles and would give him shots of pain if he tried. It’s always tragic to see since those puzzles would have been easy for Kaito otherwise. Cubik also deserts Kaito when the lead needed him most. He has his reasons and at least he had one unlike the next character, but he could have handled the situation much better than he did. It was still rather tough for him to recover from what happened in the end. Cubik also isn’t one of the better solvers to be honest. Then there is Ana who is the worse of the friends. For starters, when he deserts Kaito there is no good reason. He just couldn’t take the stress and thought that Kaito was going to die so he wanted no part of it. Even by the end of the series all he got to do was show Kaito a painting. Sure, that was Ana’s big moment, but it wasn’t nearly as emotional or impactful at the others. Ana just could have done a lot better and never taking anything seriously doesn’t help his case either. Sometimes you gotta take things seriously or overconfidence will be your downfall. Jikukawa is the mysterious student counsel president who works directly for Principal Baron. He acts like a troll most of the time and is just around to give the heroes their orders. He keeps a lot of secrets from them, but at the end of the day he does try to help them out at times. He just has the dangerous attitude of letting them go to the death puzzles and deciding that if they can’t solve them then it was simply their time. He starts taking more initiative as the series goes on and gradually becomes a better character as a result. You should only listen to corrupt orders for so long after all. Then we have the Principal who never really became a good character. Baron is one of the big members of the POG and he tries to get the heroes to solve the puzzles. The problem is that his end goal is to defy the POG but he does a really bad job of it. He’s in over his head and doesn’t even know what is happening half the time. He may as well be a villain since he does whatever they say without question. Don’t let his peaceful words fool you, the Baron is not someone that I would trust and the heroes should probably be less happy to see him each time. Then we have Jin who used to hang out with Kaito and Rook before vanishing. The way his plot goes may be a bit unsatisfying, but it was an original twist. Lets just say that the big showdown really didn’t go his way despite the guy’s confidence. Maybe he would have done a little better if he had kept the armlet. Time to look at the villains. The leader/main villain of the series is Rook. He was Kaito’s friend back in the day before vanishing. Now he is focused on destroying Kaito because he wishes they could have been friends without anyone else. Of course, I don’t trust Rook much though and I think he would have made them go through the Puzzle of God anyway. I haven’t really talked about that part much, but basically the ultimate goal of the POG is to develop a talent strong enough to challenge the Puzzle of God. Here’s where it gets a bit confusing, you need 2 solvers to challenge the puzzle at the same time since it’s a battle puzzle. The loser dies while the winner receives the Book of God which can be used to destroy the world..somehow. I don’t think the show even knows how it would work, but it’s basically just an incentive to get everyone fighting. The actual book is never all that important. Fortunately since the two solvers in the past already solved it, the book is already out in the open. Back to Rook, he’s not the greatest villain. He seems pretty intense by the end with how he wants to be with Kaito, but still chooses to act as his enemy the whole time. He let his jealousy turn him mad which wrecks all of his composure. He has a cool design, but he’s probably one of the weaker villains personality-wise. Then we have Bishop who is Rook’s right hand man. This guy was pretty cool and it’s too bad we couldn’t have seen him more. The guy’s a genius in his own right even if he is a considerable step below Rook. He always keeps his cool and helps the villains from behind the scenes. He believes in winning fair and square so he doesn’t use any cheap tactics. That definitely makes him an honorable fighter in my book. It’s certainly possible that he may return, but I just get the feeling that he probably won’t do much. Meanwhile, one of the other big villains is Elena. She’s a villain by night and an entertainer by day, but both roles involve puzzles. Her heart is never really in it compared to the others, but she still stays on the side of the POG. She may as well since she’s a celebrity and doesn’t have to fear them as much as the others. Elena is a fun character and pretty resourceful. The heroes definitely owe her for the insider information she gave them. I could definitely see her showing up again at some point. She got a lot of development so it’s time for her to challenge a puzzle as a hero. That’s basically it for the relevant cast. I’ve also covered pretty much everything about the series so it’s almost time for the wrap up. It goes without saying but the writing is also pretty solid. I think you’ll be kept engaged from start to finish. The show has a lot of replay value given how you can also choose to pause the puzzle from the start and solve it yourself. Some of them can be a bit of a stretch to solve without clues, but others are laid out from the start with a solution. You’ll just need a paper and pen handy to see if you can crack it. It’ll definitely take you longer than the characters from the show though. Overall, Phi Brain is definitely a blast. It’s a series that I highly recommend. The puzzles are really well thought out and the cast of characters are all pretty interesting as well. I think the random episodes of the heroes beating puzzles of fools and POG traps may have beaten some of the more plot based episodes of the second half, but both have their strengths. You can be satisfied with knowing that season 1 is a complete package. It’s a story that has a beginning and an ending. There isn’t even a real cliffhanger for season 2 as long as you don’t watch the preview. I’m certainly glad that there are more adventures to be had with the main cast though. They can easily hold their own plots. Even without a main villain group the puzzles would be good enough, but we do actually have a fresh villain group coming up which will be cool. They have a lot of potential.